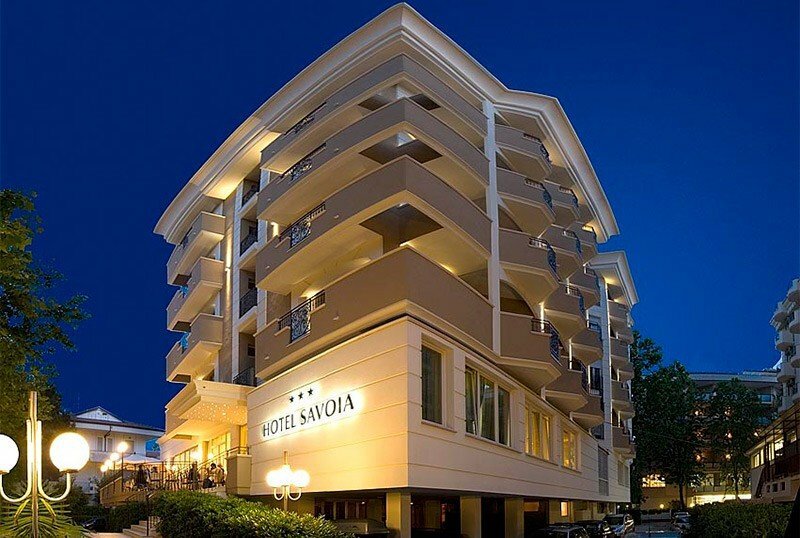 The Hotel Savoia is a 3 star family run hotel located in Valverde di Cesenatico. Completely renovated in 2006, it offers parking, garden, WI-FI and air-conditioned rooms. Equipped for cyclists and to accommodate small pets. The structure is suitable for the stay of disabled people. The hotel is just a few minutes walk from the beach and Viale Giosuè Carducci, an area full of shops and clubs. Balconies with sea view, air conditioning, WI-FI, satellite TV and digital terrestrial, private bathroom with shower and complimentary toiletries, safe, telephone, minibar. Possibility of breakfast served in the room for a fee. FAMILIES : available connecting rooms or small apartments. Sauna, garden, bicycles, terrace, outdoor and indoor playground area for children, reading room, lift, American bar, satellite TV, entertainment and theme nights, beach towel, paid laundry. The structure is equipped for cyclists. PARKING : uncovered, internal and fenced, available until exhaustion. CONVENTIONS : beach, amusement parks, discos, gym, swimming pool, spa, waterslide. Possibility of organizing paid excursions. SERVICES FOR PEOPLE WITH DISABILITIES : ground floor entrance, standard elevator, room with wheelchair maneuver, wheelchair access shower. BREAKFAST : international with sweet and savory dishes. LUNCH AND DINNER : choice between three and more menus inspired by Romagna and international cuisine, with homemade pasta and vegetable buffet. In the hotel : outdoor playground area and indoor room with cinema, library and drawing area, strollers, bike rental with child seats under the law, entertainment, pediatric assistance and baby sitter (for a fee). In the room : cots, cribs, side rails, bottle warmer and baby dryer. At meals : flexible hours, table seats, baby menu and baby food preparation. At disposal for cycling fans, secure and video-monitored garages, equipped internal workshop with bike wash corner, laundry for wetsuits, sauna and, on request, sports massages at the hotel, maps and maps of itineraries in Romagna, possibility to rent a carbon bike, recovery and rescue service, hydro-electric connections for motor vehicles teams, possibility to book expert guides, pasta and snacks on return from excursions. FULL BOARD: Bed, breakfast, lunch and dinner.